Jim B’s 1980 Uni Gran Turismo should brighten your day. I’m glad to hear the OTSG inspired enough to get this beauty back on the road. Thank You for the great site. It was/is inspirational to see the beautiful finished projects here that got me going with my restoration/rebuild. 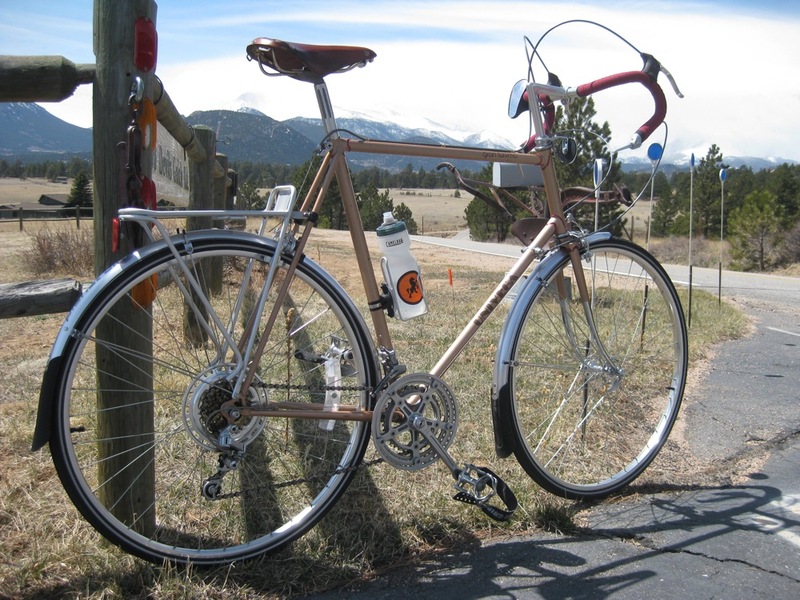 I bought this bike new in 1980 when I moved to Estes Park, CO. after I graduated from college. Rode alot for about three years but then got into job, marriage, kids, responsibility, etc,etc. The bike was hung up in our barn and was kind-of forgot about. I returned to cycling about five years ago and bought a Surly LHT to begin doing annual summer tours. It was also my daily ride. I kept looking at the Univega with questions in my mind if it was still ride worthy. After looking at all the bikes here on OTS gallery, I got it down to check it out. The bike was very dirty sharing the barn with two horses and the clouds of dirt they kick around. I took apart all the components for cleaning and lube. The tires and gum brake hoods and brake shoes had dry rotted away. Most of the bike cleaned great and I used original parts. The rebuild original parts: Frame- 62cm Cro-Moly Steel tubing. 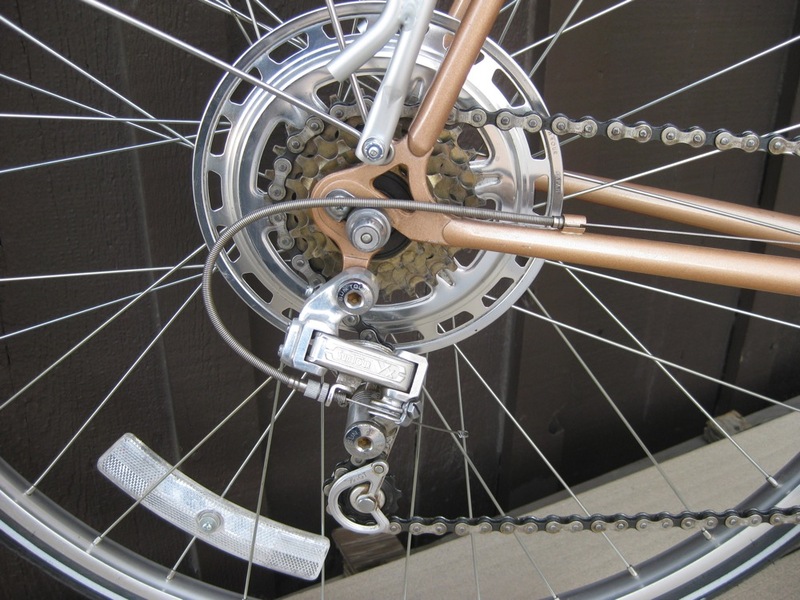 Fully lugged Brakes- Dia-Compe center pulls with Dia-Compe drilled levers. Cross Cane brake hoods (new, not original) Derailers- Front and rear SunTour Vx SunTour down tube friction shifters converted to bar ends with kit from Rivendale 5- Speed 14-26 rear cassette Crankset- SR- date stamped on back “79” 52-47-36. This was an item I wanted to change because of the mountain area I live in. My LHT is a 48-36-24. Lot’s of climbing around here, but did not have funds to replace the whole drivetrain. Maybe next winter. Wheels- Araya rims with new Schwalbe Marathon tires, 27×1 1/4—32-630 Handle bar- Sakae Randoneer Saddle- SR Laprade seat post with Brooks B-17 Honey w/ copper rivets. Brooks came off my LHT when I replaced it with a Selle Anatomica. The Brooks is modified by me and my Dremel tool with a cut-out patterned by the Anatomica cut out. 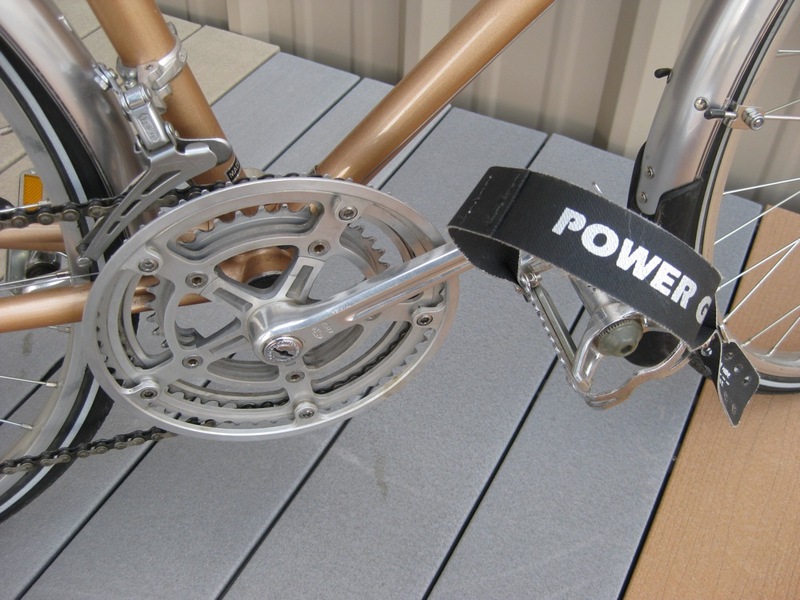 Pedals- SR platforms. They originally had beautiful toe clips with leather covered fronts. My big tugboat, size 13’s don’t fit in those now, so I replaced toe clips with extra long power grip straps. My use of this bike is to be my daily commuter plus it takes me out on my daily lunchtime mental/physical health rides. My commute is pretty short, 6 miles, so about 25 total miles per day with lunch ride tossed in. This bike was hanging up neglected for 28 years. It feels really good to “find” this great old bike again and restore it. It is a joy to ride, a bit quicker and more responsive than the LHT along with being pretty smooth and stable. I won’t ride this for any type of touring, I have the perfect beast for that. It will just take me around town to work and errands with a big smile on my face!! Jim B., you nailed it buddy! That’s what it’s all about; finding( or in your case, taking it out of the barn after years of sitting) and restoring it to a fully functional classic. Made in China bikes are a dime a dozen, but that there Uni is beautiful and one of a kind, and I’m assuming that it is a Made in Japan Uni as well. The paint job looks flawless and still very shiny; fenders, bar ends, rack, saddle, etc. all make for one nice classy ride. By the look of that bike, you must be very tall or have legs like Steve Urkel! I seem to come across “big” bikes all the time in great condition, but I have legs more like Barney Ruble…life is so unfair. Thanks Beater. I do have long legs. It is hard to find big bikes out there for projects to restore. After I did this bike I now have the bug to find more tall guy bikes out there to work on. I keep poking around garage sales….patience I guess will win the prize. Jim, I run across ’em all the time..and in mint condition. The ones that I see locally on CL seem to be there for extended periods of time. Darn my genes! All that time she was just waiting there. Your comment about the saddles is intriguing. First, the high quality of your restoration indicates that you are doubtless competent to take a scalpel to that B17. But what I take away is that you prefer the Anatomica. I realize this is not a place for a product review, I’m just curious. The fact that you slashed the Brooks makes me feel better about drilling out a perfectly good Mavic Open Sport so I could run Schrader valves. 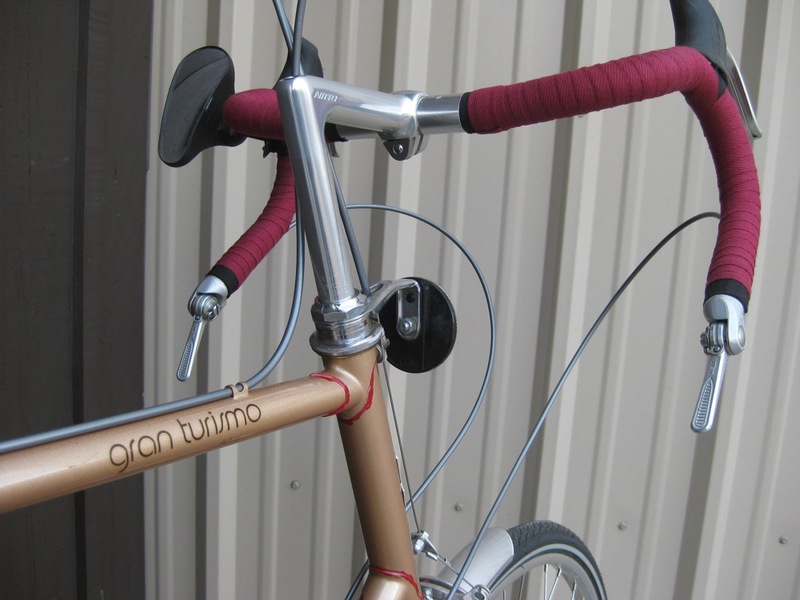 Funny you said that TPC, I rode the Anatomica on the Surly for my next tour trip last August and it was torture. I ended up selling it and put the modified Brooks back on the Surly. I bought a Brooks Imperial for the Uni and it is a real good ride, my favorite. I’ll ride the modified Brooks for my August tour this year, see how it feels after a 1000 mile tour. JIM I MUST GIVE YOU HIGH MARKS FOR THIS BEAUTY THAT YOU HAVE BREATHED NEW LIFE INTO. LOOK UNDER OTS OF THE MONTH FOR THE FINISHED PRODUCT. 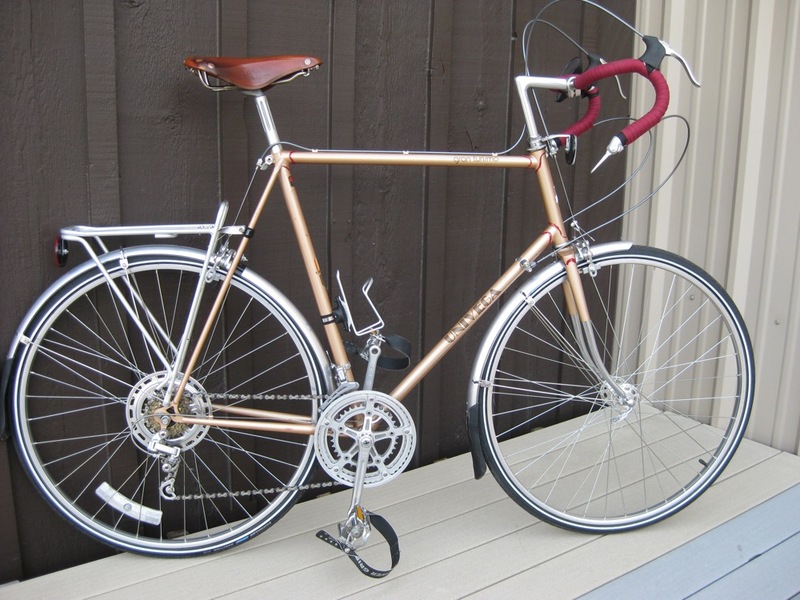 Jim, Very nice job cleaning it up and getting it back on the road, beautiful Japanese 10 speed, love the red lug lining.